A dual-formula that stays put for up to 16 hours, consisting of a liquid lipstick and a hydrating balm. I bought this lipstick a few years ago, but hardly wore it because I prefer matte lipsticks. 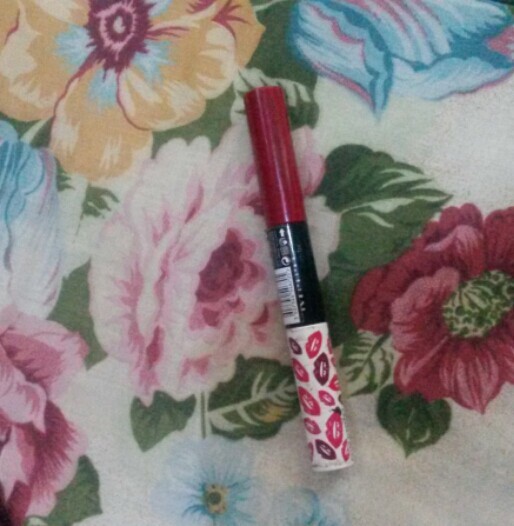 Lately my mum has been nagging me to buy a long lasting lipstick, so I thought I'd give this one another try. After applying the first step and waiting for it to dry, I reluctantly applied the second step - the lock and shine. I expected the shine to be very glossy, and was pleasantly surprised by how pretty it looked. The colour lasted the entire evening, with no need for reapplication. Needless to say I will definitely be purchasing this product in other colours. It has become one of my favourite lipsticks. 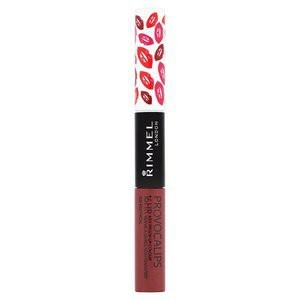 I wore Rimmel Provocalips liquid lipstick in Make Your Move on my wedding day. It's the perfect rosy-brown shade that looks great in photos. My makeup artist applied the lipstick at 13:00 (without any lip primer, liner or anything else), and I didn't have to touch it up once during the day. In fact, by the time I wanted to take it off just after midnight, it still looked freshly applied (through kissing, eating, drinking and dancing)!! I bought a tube of it prior to my wedding to have it on hand for touch-ups (which are inevitable, right? Well apparently not with this lipstick! ), and have been using it ever since. It's the perfect daytime shade for my skin tone. I find this lipstick incredibly easy to apply with the applicator in the tube. I don't ever feel the need to use a lipliner with it. It doesn't feather, bleed or transfer at all (especially after the gloss coat has dried down). 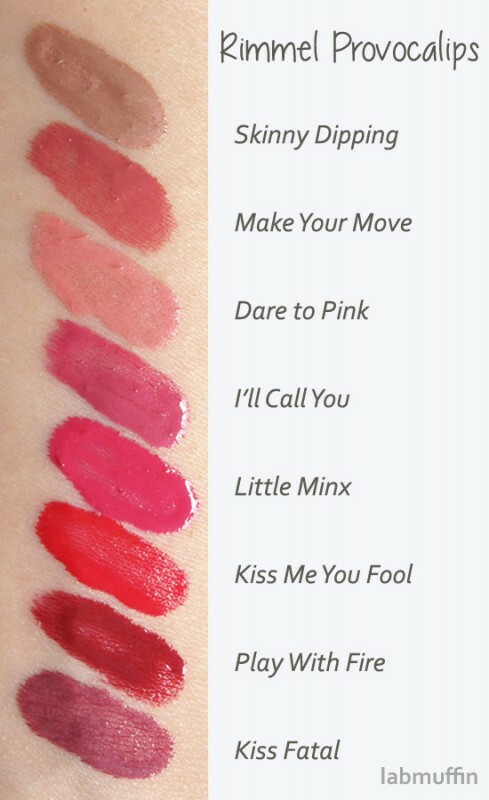 The Provocalips lipstick comes with a coloured side (which you apply first and allow to dry), and a gloss side (applied after the colour is dry). The gloss isn't super glossy, and after about half an hour, it dries down to a soft matte finish, which I like. I didn't find the formula to be overly drying on my lips either, especially after the gloss was applied. If you like a solid long-wearing lipstick, this is for you! I can't wait to buy a few more shades! I stumbled across this while I was searching the internet. It was on sale at zando.com for ZAR75.00 ? Forget about it! I bought two. Just to make sure it works (like I haven't read all the reviews about it I could get my eyes on) Mmmmaan! It delivered faster than the pizza guy.! I was a bit sceptic because of the lipgloss like tube (I don't like the whole brush excess product, you know the usual when it comes to applying gloss) I love my coffee And this lipstick loved my lips even more. I am so in love with this product that words won't do it justice. I made everyone at home try it out and it was stars in everyone's eyes. Every girl should have this in her purse. I love that this is a dual product ..a liquid lipstick that is followed by a balm that adds a lovely glossy look as well as keeping my lips hydrated . The color i have is called 'kiss fatal' ,which is a rich berry color. The lipstick itself, when applied feels light and still feels that way even after applying the balm. It lasts a few hours if i dont eat or drink,not 16 hours as claimed but still a great lippie to own. To be honest I am not a fan of lipsticks, well only if they are super long wearing like some lip stains. I used the Revlon Colorstay Overtime lip colours for a really long time until I actually lost it and it made me super sad. It was my go to lip colour , it literally lasted all day and never transferred on anything no matter how much coffee I drank or what I ate , and yes even after make out sessions with my boyfriend (giggling) it was still there at the end of the day.These are definitely the kind of things I look for in the perfect lip product I hate reapplying during the day and having to worry about lipstick on my teeth ahhh that’s the worst. Lets talk about what I thought about using these… Firstly the colour selection is great! I got one shade of each of the standard shades I love to wear.The colours are super pigmented the lip colour comes with two sides one which has the lip colour and the other side has a clear lip product ,this makes the colour lock in and the reason why it actually lasts so long. I found that these are best used after making sure you have no flakes or cracks on your lips, as these tend to get extremely drying throughout the day. 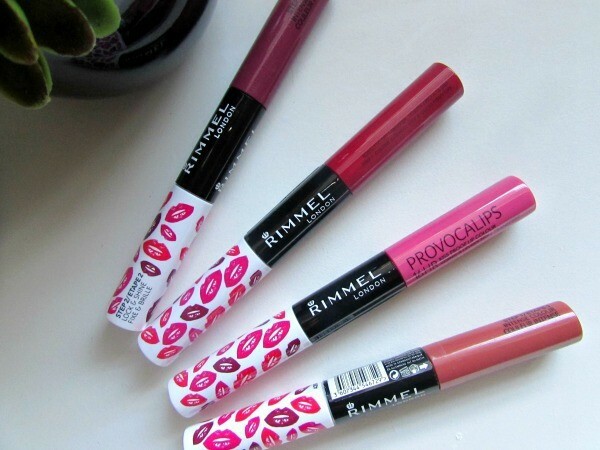 I am however highly impressed with the longevity of these Rimmel Provocalips lip colours – they literally lasted me all day with no transfer at all. I did find that the lighter shades the mauve on in particular just didn’t last as long as the others. Do they last 16 hours? The darker shades definitely do if not longer!I struggled to remove them at the end of the night when getting reading for bed. For only R99 this is an awesome range of lip colours to have in your collection and I am definitely going to be adding more. I personally won’t ever be going back to normal lipsticks I just can’t deal with reapplying all day and and lipstick on my teeth! I bought two of these fabulous lipcolour and gloss lipsticks. Wont come off at all. Reapply gloss as it make feel a bit dry. LOVELY COLOR ALL DAY LONG! The best liquid lipstick ever! I have been following quite a few beauty and make up pages on instagram and recently the trend of liquid lip color has been so popular. This thing REALLY stays on ALL DAY!! Love the pigmentation of the product as well as being Indian skin toned, I was worried that colors such as the Pink would not show up as flattering on me - BUT it was perfect! LOVE LOVE LOVE this product! The "step 2" moisturising gloss thing smells amazing and really keeps your lips nice and soft after you've applied the color. The 16 hrs of Lip Liberation wild without a trace Provocalips!! Kiss Fatal step 1 and 2 is my new best friend. I am talking about the lip stain that survived my breakfast, tea break, lunch break, dinner and shower. It stayed even longer then my Mac Make - up. I recommend Provocalips to all the ladies and it's easy to apply. You put colour first for about 60 seconds then apply top coat to lock the colour, moisturise and shine. Provocalips is only R 99. 99 at any click stores and it is worth every penny. It is smooth, prevents lips from drying and its non sticky. Oops! ! I just kissed and told!!! 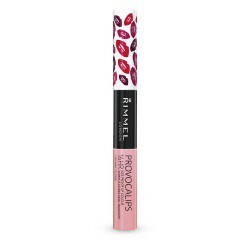 I have recently purchased this product and was pleasantly surprised, as it really does last for 16 hours :-) It does dry your lips a bit, but continues application of lip gloss works for this. Superb product! Everyone has been going on about this, so I had major FOMO. I recently purchased the berry-shade and was exceptionally happy with the longevity that it has to offer. To put things in perspective, you have to SCRUB it off the next day. For the price, I find it to be a great dupe for other more expensive brands like Max Factor. The only real issue I have, is they are a little limited with shades - guys, I want - no- NEED more!!! 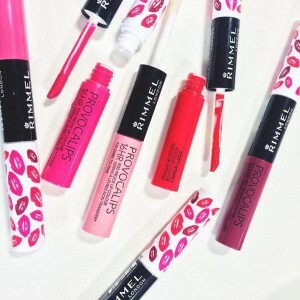 I once or twice purchased Rimmel provocalips lipstick and oh! Boy it left my lips so soft. I like the fact that it made my lips look so thick and shiny not to mention provocative as well. Think I will include in to my next visit to clicks for the job it does its worth the price. So I purchased one of these, not really expecting much or having much faith that they would do what they claimed. However, I was beyond thrilled with my purchase. The colour is stunning, the application is so easy and the smell is amazing. It feels great on the lips and is not drying. The only thing I did after a few hours was apply a slick of balm to moisturise it again, and it looked as though I had freshly applied it! It lasts for hours, it really does not come off on anything (kissing, glasses, mugs, cutlery, ANYWHERE) and it exceeded my expectations. The picture attached shows what it looked like when I applied it, and what it looked like six hours later after a huge family supper, before I took it off for bed. I cannot recommend this product enough, and the price makes it a real steal. I love colourful lipsticks. What I don't love is having to touch them up every 5 minutes. These are absolutely incredible - you apply the colour to your lips, give it a while to dry/set, and then apply the gloss/sealer end over it. The colour DOES NOT BUDGE! I actually tested the purple - I have the purple and red shades - and applied it at 8am. I went through a day of drinking lots of water, coffee, tea, eating lunch and a banana, and by the time I left for my riding lesson at 3pm, it was still there. It had faded slightly in the centre, but it was still there enough that I didn't need to touch it up, and it looked great! While it can tend to be a bit drying, this isn't something you can't fix - I apply a lipbalm before the lipstick, and if necessary I touch up the gloss end just for more moisture. A must have for any lippie lover! 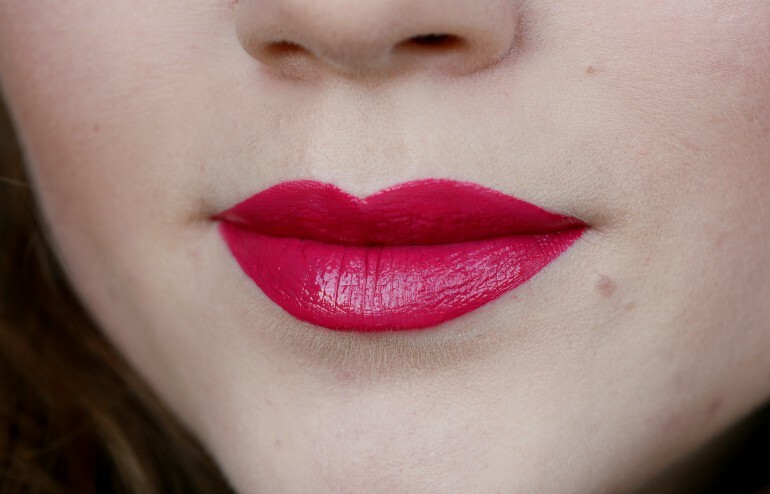 My cousin bought me the rimmel provocalips in the shade 310 "Little Minx" which is a great deep but bright pink. I am always skeptical when it comes to lip glosses/lipsticks that claim to last a long time but decided to give this one a try yesterday. Well, 18 hours later and the colour is still on my lips! sure it has faded but i have not had to reapply! I am amazed! it doesn't leave any stickiness, which is a big thumbs up. I also love that you can gloss it up with the clear gloss coating or leave it as a matte finish by just applying the colour. The colour is easy and super smooth to apply. The price is fantastic too. Only negative about this product is that it takes a bit of a scrub to get it off, which can be a bit frustrating. All in all, a great product worth buying. 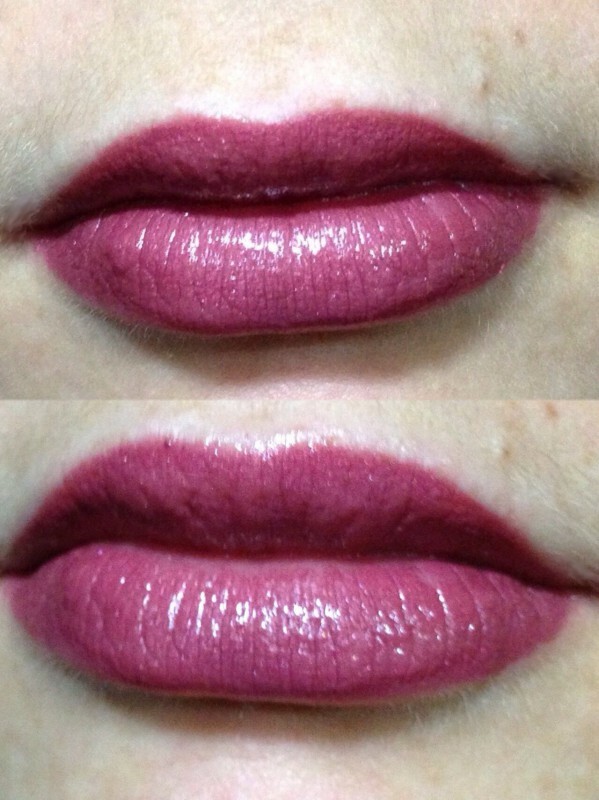 I tried Rimmel Provocalips in 230 Kiss Fatal, a seductive, rich berry shade. 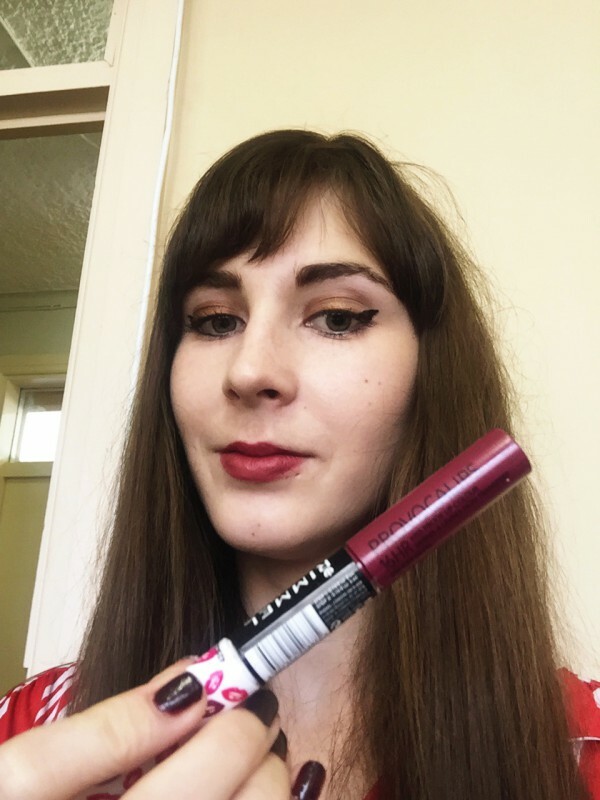 I was intrigued by the idea of the dual formula - a liquid lipstick and a glossy topcoat to lock the colour in place - and couldn't wait to try it out. The liquid lipstick was smooth and lightweight. I then applied the gloss coat on top, which gave it a beautiful shine and amplified the colour. Amazingly, the product remained lightweight. It lasted fairly long as well, although the 16h claim was a bit too ambitious. The top coat prevented the liquid lipstick from being drying, as liquid lipsticks often are. A great buy for any lippie lover!